This is “Why Is Public Speaking Important?”, section 1.1 from the book Public Speaking: Practice and Ethics (v. 1.0). For details on it (including licensing), click here. 1.1 Why Is Public Speaking Important? Explore three types of public speaking in everyday life: informative, persuasive, and entertaining. Understand the benefits of taking a course in public speaking. Explain the benefits people get from engaging in public speaking. In today’s world, we are constantly bombarded with messages both good and bad. No matter where you live, where you work or go to school, or what kinds of media you use, you are probably exposed to hundreds. if not thousands, of advertising messages every day. Researcher Norman W. Edmund estimates that by 2020 the amount of knowledge in the world will double every seventy-three days.Edmund, N. W. (2005). End the biggest educational and intellectual blunder in history: A $100,000 challenge to our top educational leaders. Ft. Lauderdale, FL: Scientific Method Publishing Co. Because we live in a world where we are overwhelmed with content, communicating information in a way that is accessible to others is more important today than ever before. To help us further understand why public speaking is important, we will first examine public speaking in everyday life. We will then discuss how public speaking can benefit you personally. Every single day people across the United States and around the world stand up in front of some kind of audience and speak. In fact, there’s even a monthly publication that reproduces some of the top speeches from around the United States called Vital Speeches of the Day (http://www.vsotd.com). Although public speeches are of various types, they can generally be grouped into three categories based on their intended purpose: informative, persuasive, and entertaining. One of the most common types of public speaking is informative speakingSpeaking with the purpose of sharing knowledge or information with an audience.. The primary purpose of informative presentations is to share one’s knowledge of a subject with an audience. Reasons for making an informative speech vary widely. For example, you might be asked to instruct a group of coworkers on how to use new computer software or to report to a group of managers how your latest project is coming along. A local community group might wish to hear about your volunteer activities in New Orleans during spring break, or your classmates may want you to share your expertise on Mediterranean cooking. What all these examples have in common is the goal of imparting information to an audience. Informative speaking is integrated into many different occupations. Physicians often lecture about their areas of expertise to medical students, other physicians, and patients. Teachers find themselves presenting to parents as well as to their students. Firefighters give demonstrations about how to effectively control a fire in the house. Informative speaking is a common part of numerous jobs and other everyday activities. As a result, learning how to speak effectively has become an essential skill in today’s world. A second common reason for speaking to an audience is to persuadeThe intentional attempt to get another person or persons to change or reinforce specific beliefs, values, and/or behaviors. others. In our everyday lives, we are often called on to convince, motivate, or otherwise persuade others to change their beliefs, take an action, or reconsider a decision. Advocating for music education in your local school district, convincing clients to purchase your company’s products, or inspiring high school students to attend college all involve influencing other people through public speaking. For some people, such as elected officials, giving persuasive speeches is a crucial part of attaining and continuing career success. Other people make careers out of speaking to groups of people who pay to listen to them. Motivational authors and speakers, such as Les Brown (http://www.lesbrown.com), make millions of dollars each year from people who want to be motivated to do better in their lives. Brian Tracy, another professional speaker and author, specializes in helping business leaders become more productive and effective in the workplace (http://www.briantracy.com). Whether public speaking is something you do every day or just a few times a year, persuading others is a challenging task. If you develop the skill to persuade effectively, it can be personally and professionally rewarding. Entertaining speakingSpeech designed to captivate an audience’s attention and regale or amuse them while delivering a clear message. involves an array of speaking occasions ranging from introductions to wedding toasts, to presenting and accepting awards, to delivering eulogies at funerals and memorial services in addition to after-dinner speeches and motivational speeches. Entertaining speaking has been important since the time of the ancient Greeks, when Aristotle identified epideictic speaking (speaking in a ceremonial context) as an important type of address. As with persuasive and informative speaking, there are professionals, from religious leaders to comedians, who make a living simply from delivering entertaining speeches. As anyone who has watched an awards show on television or has seen an incoherent best man deliver a wedding toast can attest, speaking to entertain is a task that requires preparation and practice to be effective. Oral communication skills were the number one skill that college graduates found useful in the business world, according to a study by sociologist Andrew Zekeri.Zekeri, A. A. (2004). College curriculum competencies and skills former students found essential to their careers. College Student Journal, 38, 412–422. That fact alone makes learning about public speaking worthwhile. However, there are many other benefits of communicating effectively for the hundreds of thousands of college students every year who take public speaking courses. Let’s take a look at some of the personal benefits you’ll get both from a course in public speaking and from giving public speeches. One of the very first benefits you will gain from your public speaking course is an increased ability to think critically. Problem solving is one of many critical thinking skills you will engage in during this course. For example, when preparing a persuasive speech, you’ll have to think through real problems affecting your campus, community, or the world and provide possible solutions to those problems. You’ll also have to think about the positive and negative consequences of your solutions and then communicate your ideas to others. At first, it may seem easy to come up with solutions for a campus problem such as a shortage of parking spaces: just build more spaces. But after thinking and researching further you may find out that building costs, environmental impact from loss of green space, maintenance needs, or limited locations for additional spaces make this solution impractical. Being able to think through problems and analyze the potential costs and benefits of solutions is an essential part of critical thinking and of public speaking aimed at persuading others. These skills will help you not only in public speaking contexts but throughout your life as well. As we stated earlier, college graduates in Zekeri’s study rated oral communication skills as the most useful for success in the business world. The second most valuable skill they reported was problem-solving ability, so your public speaking course is doubly valuable! Another benefit to public speaking is that it will enhance your ability to conduct and analyze research. Public speakers must provide credible evidence within their speeches if they are going to persuade various audiences. So your public speaking course will further refine your ability to find and utilize a range of sources. A second benefit of taking a public speaking course is that it will help you fine-tune your verbal and nonverbal communication skills. Whether you competed in public speaking in high school or this is your first time speaking in front of an audience, having the opportunity to actively practice communication skills and receive professional feedback will help you become a better overall communicator. Often, people don’t even realize that they twirl their hair or repeatedly mispronounce words while speaking in public settings until they receive feedback from a teacher during a public speaking course. People around the United States will often pay speech coaches over one hundred dollars per hour to help them enhance their speaking skills. You have a built-in speech coach right in your classroom, so it is to your advantage to use the opportunity to improve your verbal and nonverbal communication skills. An additional benefit of taking a public speaking class is that it will help reduce your fear of public speaking. Whether they’ve spoken in public a lot or are just getting started, most people experience some anxiety when engaging in public speaking. Heidi Rose and Andrew Rancer evaluated students’ levels of public speaking anxiety during both the first and last weeks of their public speaking class and found that those levels decreased over the course of the semester.Rose, H. M., & Rancer, A. S. (1993). The impact of basic courses in oral interpretation and public speaking on communication apprehension. Communication Reports, 6, 54–60. One explanation is that people often have little exposure to public speaking. By taking a course in public speaking, students become better acquainted with the public speaking process, making them more confident and less apprehensive. In addition, you will learn specific strategies for overcoming the challenges of speech anxiety. We will discuss this topic in greater detail in Chapter 3 "Speaking Confidently". If you don’t like something about your local government, then speak out about your issue! One of the best ways to get our society to change is through the power of speech. Common citizens in the United States and around the world, like you, are influencing the world in real ways through the power of speech. Just type the words “citizens speak out” in a search engine and you’ll find numerous examples of how common citizens use the power of speech to make real changes in the world—for example, by speaking out against “fracking” for natural gas (a process in which chemicals are injected into rocks in an attempt to open them up for fast flow of natural gas or oil) or in favor of retaining a popular local sheriff. One of the amazing parts of being a citizen in a democracy is the right to stand up and speak out, which is a luxury many people in the world do not have. So if you don’t like something, be the force of change you’re looking for through the power of speech. Have you ever thought about climbing the corporate ladder and eventually finding yourself in a management or other leadership position? If so, then public speaking skills are very important. Hackman and Johnson assert that effective public speaking skills are a necessity for all leaders.Hackman, M. Z., & Johnson, C. E. (2004). Leadership: A communication perspective (4th ed.). Long Grove, IL: Waveland. If you want people to follow you, you have to communicate effectively and clearly what followers should do. According to Bender, “Powerful leadership comes from knowing what matters to you. Powerful presentations come from expressing this effectively. It’s important to develop both.”Bender, P. U. (1998). Stand, deliver and lead. Ivey Business Journal, 62(3), 46–47. One of the most important skills for leaders to develop is their public speaking skills, which is why executives spend millions of dollars every year going to public speaking workshops; hiring public speaking coaches; and buying public speaking books, CDs, and DVDs. Even if you are not in an official leadership position, effective public speaking can help you become a “thought leaderAn individual who contributes new ideas that help various aspects of society..” Joel Kurtzman, editor of Strategy & Business, coined this term to call attention to individuals who contribute new ideas to the world of business. According to business consultant Ken Lizotte, “when your colleagues, prospects, and customers view you as one very smart guy or gal to know, then you’re a thought leader.”Lizotte, K. (2008). The expert’s edge: Become the go-to authority people turn to every time [Kindle 2 version]. New York, NY: McGraw-Hill. Retrieved from Amazon.com (locations 72–78) Typically, thought leaders engage in a range of behaviors, including enacting and conducting research on business practices. 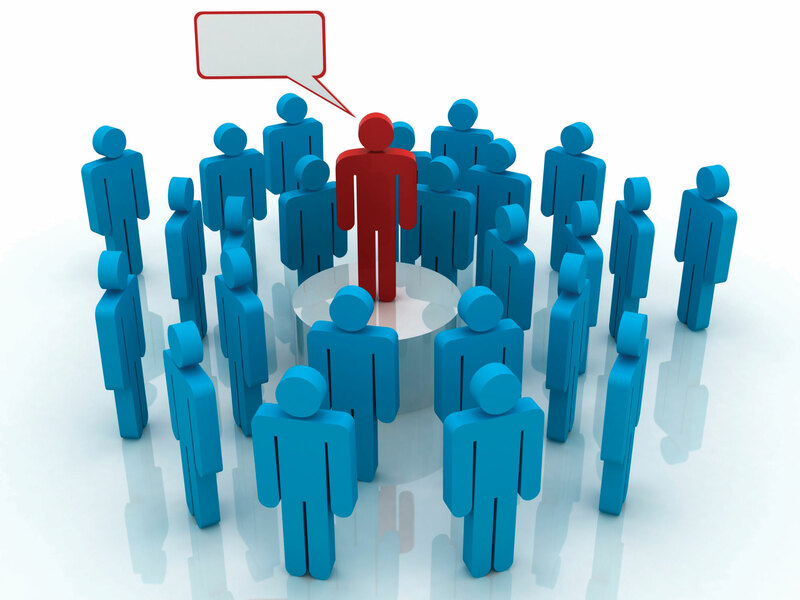 To achieve thought leader status, individuals must communicate their ideas to others through both writing and public speaking. Lizotte demonstrates how becoming a thought leader can be personally and financially rewarding at the same time: when others look to you as a thought leader, you will be more desired and make more money as a result. Business gurus often refer to “intellectual capital,” or the combination of your knowledge and ability to communicate that knowledge to others.Lizotte, K. (2008). The expert’s edge: Become the go-to authority people turn to every time [Kindle 2 version]. New York, NY: McGraw-Hill. Retrieved from Amazon.com Whether standing before a group of executives discussing the next great trend in business or delivering a webinar (a seminar over the web), thought leaders use public speaking every day to create the future that the rest of us live in. People have many reasons for engaging in public speaking, but the skills necessary for public speaking are applicable whether someone is speaking for informative, persuasive, or entertainment reasons. Taking a public speaking class will improve your speaking skills, help you be a more critical thinker, fine-tune your verbal and nonverbal communication skills, and help you overcome public speaking anxiety. Effective public speaking skills have many direct benefits for the individual speaker, including influencing the world around you, developing leadership skills, and becoming a go-to person for ideas and solutions. Talk to people who are currently working in the career you hope to pursue. Of the three types of public speaking discussed in the text, which do they use most commonly use in their work? Read one of the free speeches available at http://www.vsotd.com. What do you think the speaker was trying to accomplish? What was her or his reason for speaking? Which personal benefit are you most interested in receiving from a public speaking class? Why?